I have been sick since last week and thus explained no movement in this little blog of mine. Last Thursday, I brought my son to the Polyclinic for the referral letter to get his heart tested. All the preliminary tests done there came out negative, so this is really a good blessing. I was so upset by his behaviour at the clinic that I actually had an asthma attack there. I was put on 13 puffs and 6 tablets of Prednisolone (my usual is 2 puffs and 2 tablet of Prednisolone) and after that, I had many sleepless nights. It seems that the side effect from the tablets. I am still not really well yet, been having breathlessness and a tight chest. Anyway, on a happier note, my son came home feeling chirpy. Though he failed his Maths but he came home with 4As on four other subjects! I am so proud of him. Let's hope the other 2 more subjects is just as good. A happy son = to a happy household. Everyone is happy. 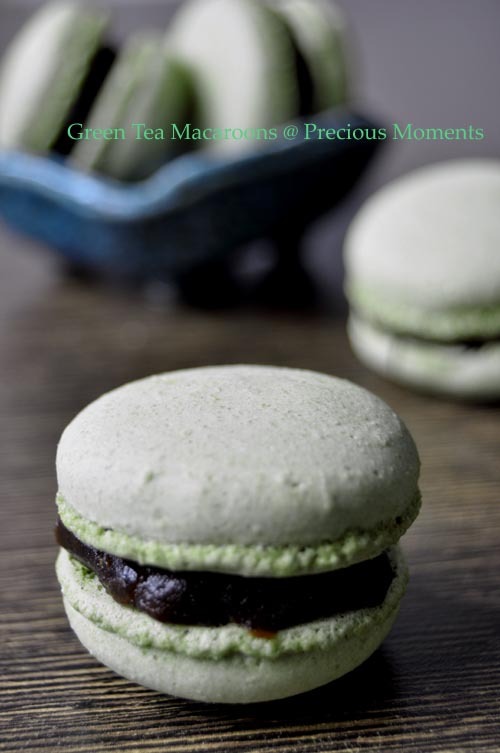 So I rewarded him with no studies for the night and Green Tea Macaroons with red bean fillings. I actually baked these before I fell ill. So tonight, I took the easy way out, I filled it with home made red bean paste, too exhausted to make red bean buttercream. Good job boy! I hope you will continue with this. I know you can do it! Oh do take care Edith! Hopefully the side effects are all gone now. And congrats to your son on getting 4As! Look after yourself better, Edith. And hope the son realises how fortunate he is to have a mother like you. Hope u've fully recovered and be able to relax! I tried to make the same green tea macarons but failed two times so far! Edith, do take care! Try not to get too upset easily. Your son will grow up one day and understand all that you've been through! Keep praying! Take care and rest more. And don't forget your vits as well. Congrats on your son .. good job! edith, hope that you're getting much better now. Rest more and wishing you a beautiful day! Have plenty of rest and take good care !! ;-( Sorry that you haven't felt well..so many tablets..that would kill me too. Take really good care of yourself. I was told by my Pharmacist in Australia NOT to take Prednisolone at night - it will keep you awake. Only take it in the morning. Pray that God will be with you alwasys. Take care. Angie's Recipes, I was actually shocked that I gotten such heavy doses. Didn't know I was in such bad shape then. Leen, yah afer I took it only in the morning. then I remembered my GP told me about the side effects. But I was in really bad shape and I needed to open my airway badly. So no choice.